Back in 2015, you may remember there was an outbreak in Chicago of a newer strain of canine influenza, H3N2. Prior to the Chicago outbreak, the H3N2 strain had only been identified in Korea, China, and Thailand. The H3N2 spread from Chicago to a number of states in the Midwest. Outbreaks have continued to occur throughout the United States since 2015. 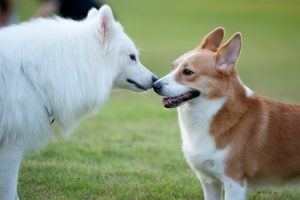 Which brings us to the latest news – there have been confirmed cases of the H3N2 virus in the Southeast associated with recent dog shows in Florida and Georgia. Additionally, there has been at least one confirmed case of the H3N2 strain in a dog in Morehead City, NC who attended one of those dog shows. Historically, the United States had only seen a different canine influenza strain: H3N8. The H3N8 strain was first discovered in 2004 in Florida in racing greyhounds after the entire genome of the H3N8 equine influenza virus was transferred to dogs (a rare event in adaptive evolution). Since that time, the H3N8 strain has waxed and waned in 40 different states. Canine influenza is a highly contagious, emerging pathogen in dogs. Since it is a newer virus in the canine population, the majority of dogs still do not have immunity. Eighty percent of all dogs exposed to the virus will contract the illness. Transmission can occur through close proximity to infected dogs (the airborne virus can travel up to 20 feet), contact with contaminated items (bowls, leashes, crates, etc. ), and people carrying the virus from an infected dog to an uninfected dog. The virus lives up to 24 hours on soft surfaces (e.g., clothing), up to 48 hours on hard surfaces, and up to 12 hours on hands. Outbreaks of canine influenza tend to occur in situations where groups of dogs are kept close together– for example racing tracks, kennels, shelters, and dog day care facilities. No human infections have been reported in association with either of the canine influenza strains. There have been cases documented of transmission of the H3N2 strain to cats. Dogs will develop clinical signs within 2 to 4 days of exposure. The highest amount of viral shedding occurs during this incubation period (when there are no symptoms). Once symptoms begin, the dog may have signs such as coughing, sneezing, nasal or ocular discharge, anorexia, lethargy, or fever (note that a normal dog’s temperature is between 100.5 and 102.5). Some dogs may not show signs at all but could still shed or transmit the virus. In dogs that become clinical, both mild and severe forms of the disease have been identified. Thankfully most dogs will develop the mild form. Dogs can take 2 to 3 weeks to recover from canine influenza. Treatment is symptomatic. Dogs can shed the H3N8 strain for up to 10 days and the H3N2 strain for up to 26 days after exposure. It is important to note that the respiratory symptoms seen with canine influenza can also be caused by many other reasons, so the presence of these symptoms does not confirm that canine influenza virus is the cause. If your pet is demonstrating signs of illness, the best thing to do is have your pet examined by one of our veterinarians. The best strategy to prevent canine influenza is vaccination. A relatively new vaccine is now available that protects against both H3N8 and H3N2 strains. The initial series requires an initial vaccine, followed by a booster shot 2 weeks later. A dog is not considered fully protected until 7 to 14 days after the second (booster) shot. The vaccine is then updated once annually. Lawndale Veterinary Hospital has not diagnosed any cases of canine influenza associated with this recent outbreak to date. We are recommending that owners consider vaccinating all dogs who have any contact with other dogs, especially in group situations.